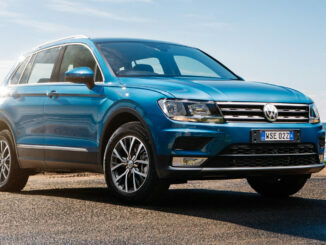 This stylish family SUV is not going to Disco-point you! 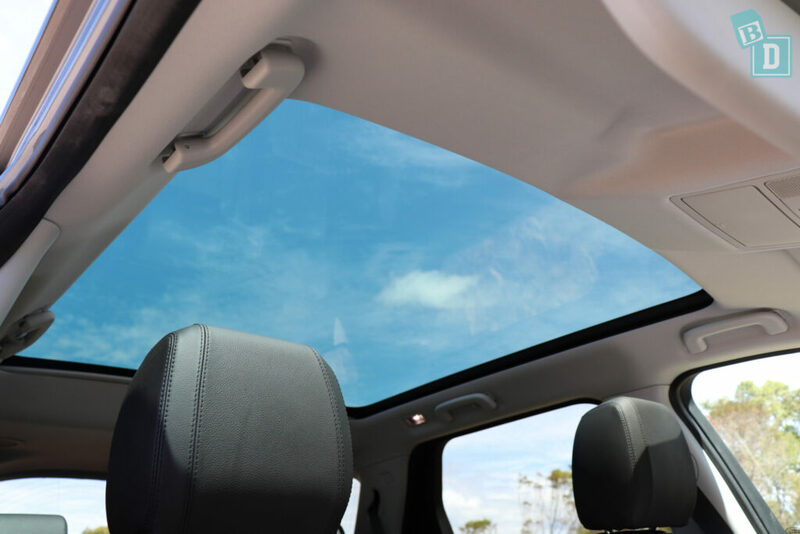 I was very excited to be testing the Land Rover Discovery Sport, it was a beautiful blue colour and the enormous sunroof made it a delight to drive in. 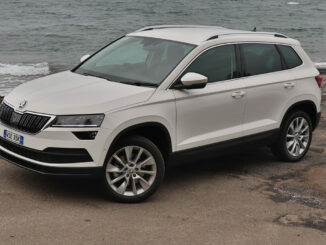 The model I tested was a five-seater, so I couldn't test the third-row seats. 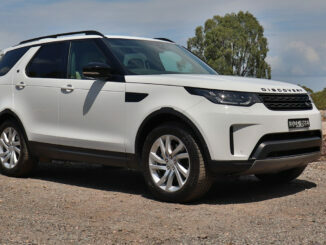 However, I enquired with Land Rover and there are no top tether anchorages or ISOFix in the third-row seats. 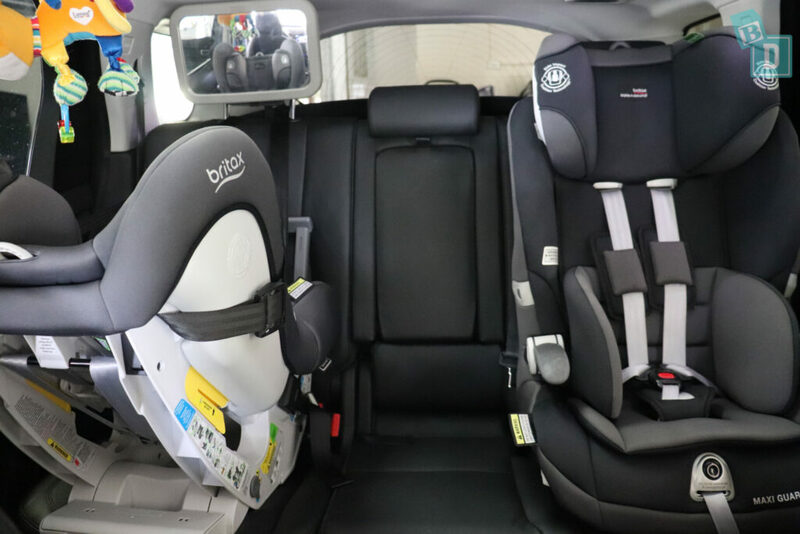 Also, to access the third-row seats you would need to uninstall a child seat in order to bring one of the outer second-row seats forward and have room to climb through in a seven-seater model. 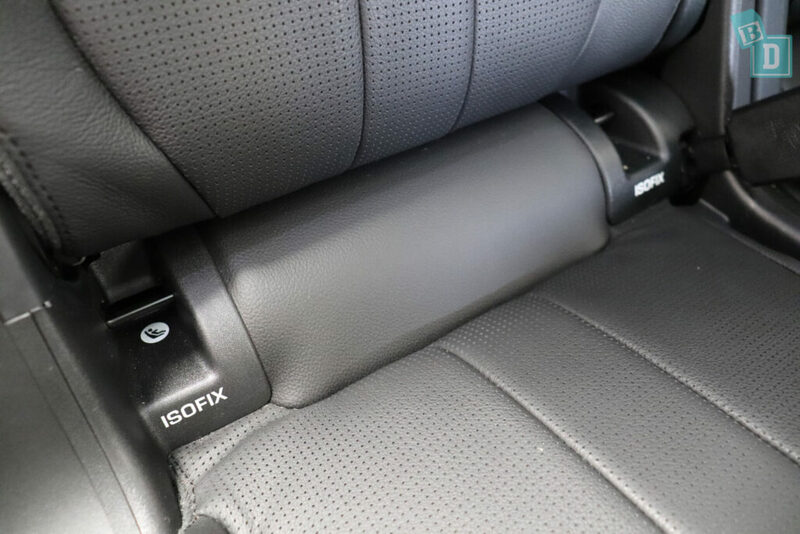 There are ISOFix points in the two outer second-row seats, within plastic guides and easy to connect to. 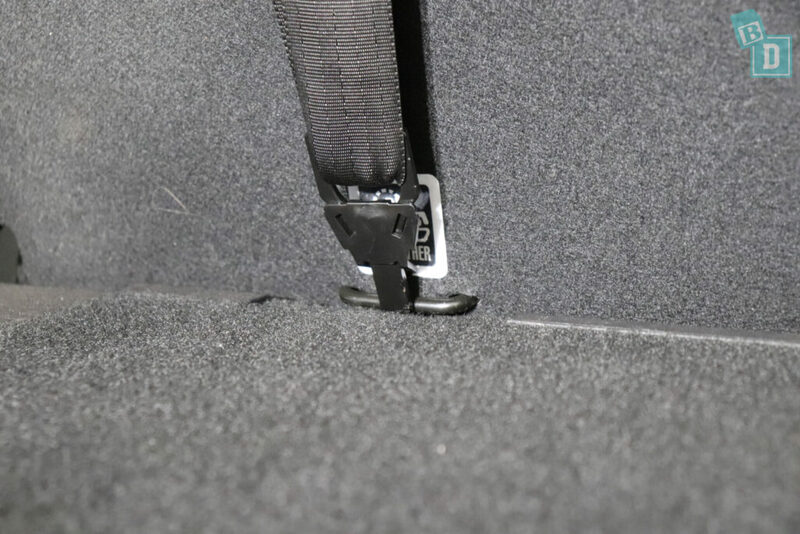 The top tether anchorages on the back of all three second-row seats are not within plastic guides, they are right down the bottom of the seat backs. They are positioned flush with the boot floor so I found them really difficult to access and the fabric on the seatback made them difficult to connect to and I kept connecting on to that rather than the anchorage. I could fit two child seats into the back of the Discovery Sport, there was just enough room for me to sit between the two child seats when using the ISOFix. Legroom was really good in the five-seater Discovery Sport, the second-row seats do slide back and forward on a 60:40 split and in the furthest back position, we had plenty of legroom for a 182cm passenger in front of a rear facing child seat. 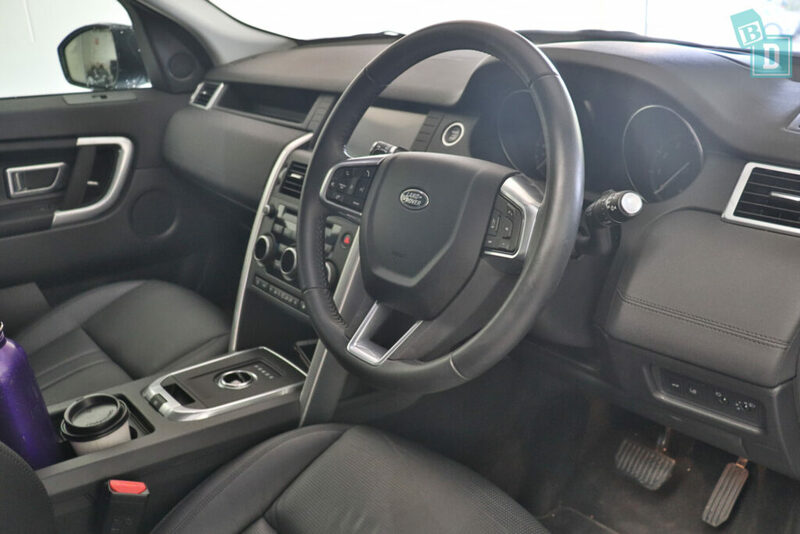 The interior of the Discovery Sport is very pleasant too, the seats are nicely leather upholstered. Storage is quite good although none of the door bins would hold a large refillable water bottle which is always Disco-pointing! 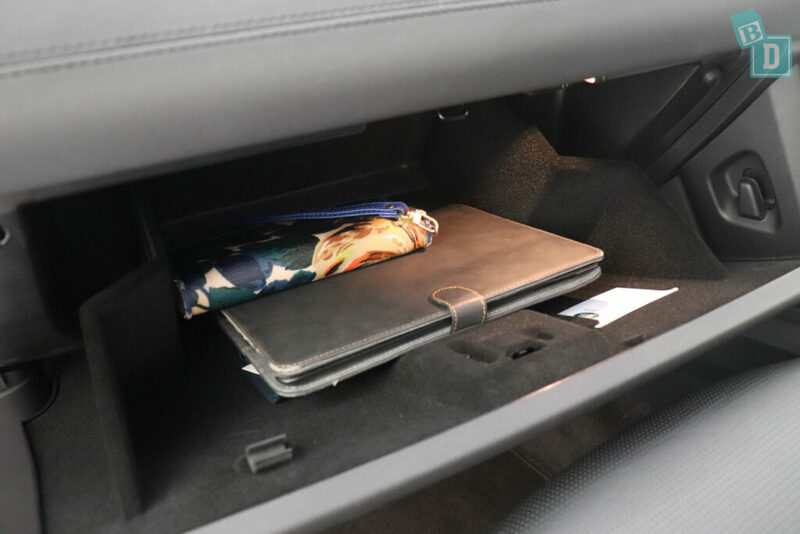 The glove box is a nice size to hold an iPad and wallet with the manual and there is a lined glasses case in the ceiling. There are a lot of USB points in both rows, there are some in the central console box and in the back of the central console box for rear passengers. 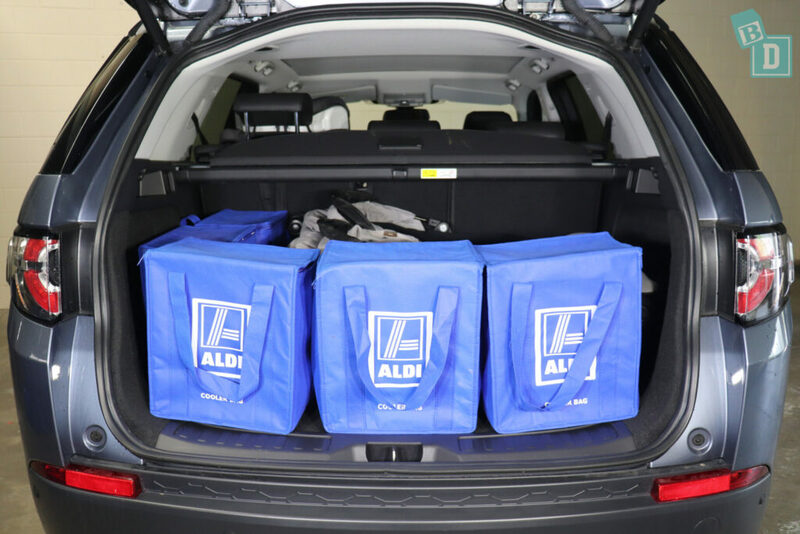 The boot of the five-seater opens and closes silently which is lovely and it was adequately sized, holding 14 shopping bags and depending on the needs of your family, it would hold all size prams or strollers with shopping bags in there with them. 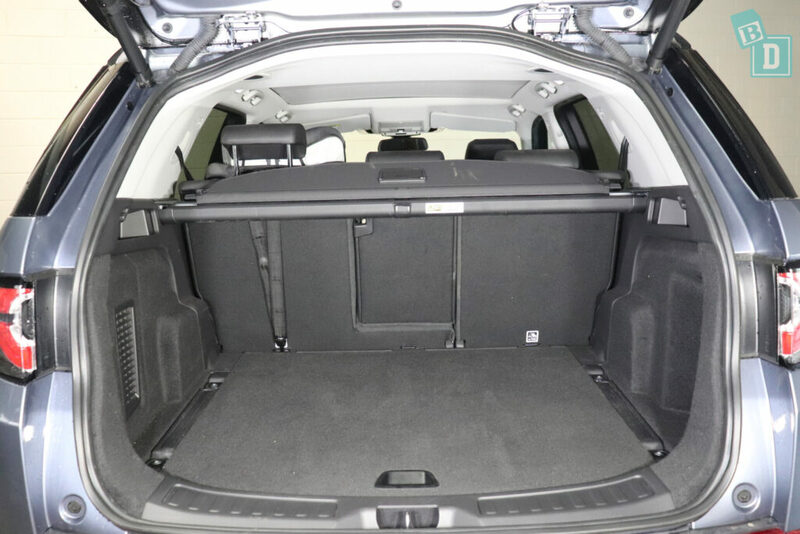 Although I didn't get to test the seven-seater I think given the size of the Discovery Sport that if you had a third row of seats in there the boot space would be very small. 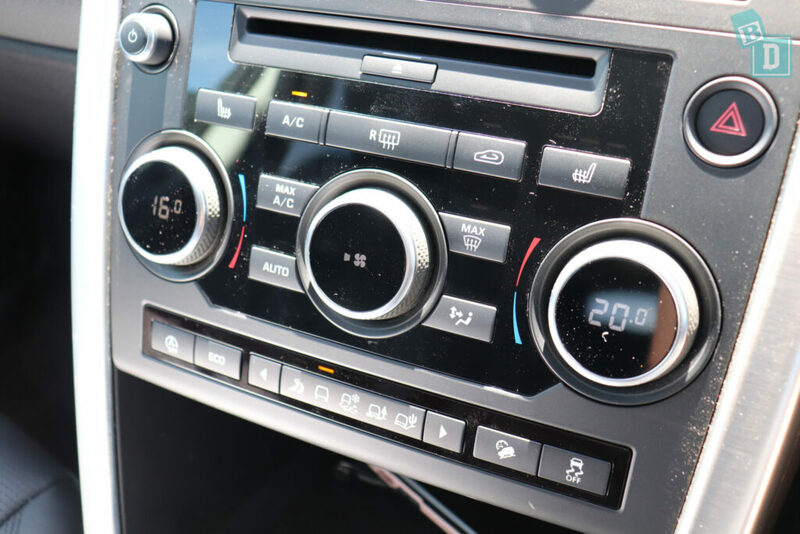 The air conditioning in the Discovery Sport is easy to use and there are pillar vents in the second-row pillars which made a big difference on hot days, they provided a nice subtle airflow without blasting the rear passengers. The Discovery Sport feels really solid and robust to drive and despite that the steering is light. BUT it does feel a little bit lurchy or reluctant to go when accelerating from still on occasions. Road and engine noise are both good and I found no real beeps or baby waking noises with Discovery Sport. 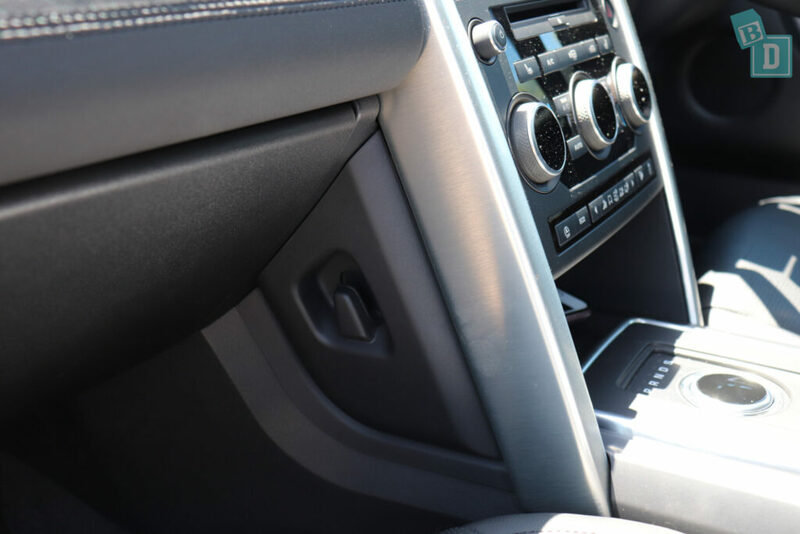 The gear lever is a dial that rises up out of the central console when you turn the car on, it is very slick and smooth in your hand, although I found I couldn't confidently change gear without having to look down at the dial, which I did find frustrating at times. One of my favourite features in the Discovery Sport is the seatbelt removal visual on the display in front of the steering wheel. It lights the people up green or red depending on whether their seatbelt is fastened and is just a really clear easy visual to know who it is in the back that's taken their belt off! One of my other favourite features is the child lock button on the driver's door, just pressing the button locks the windows and doors in the rear so little passengers can't meddle with either! 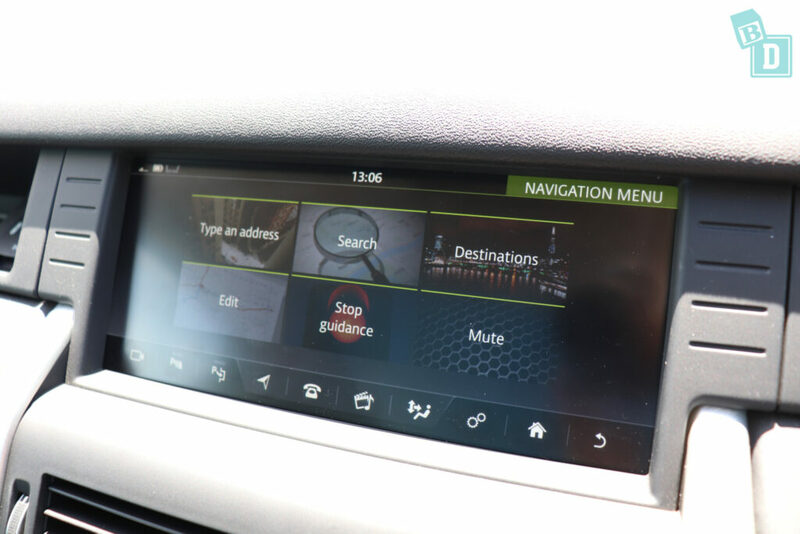 The media system in the Discovery Sport is a bit of a let down for me as the visuals used are very outdated and although it is very clear and clean looking, it doesn't have Apple CarPlay or Android Auto. I would expect more from this brand and want that seamless transition from office to car with my technology. The built-in sat-nav had a lovely big button for muting the navigation voice, which is a definite help plus point! The cruise control was also a bit of a letdown (not of the milky kind!!!) and was fine for flat motorway driving but at 60km/h on undulating roads, it ran well away with itself downhill up to 10km/h over the set speed. 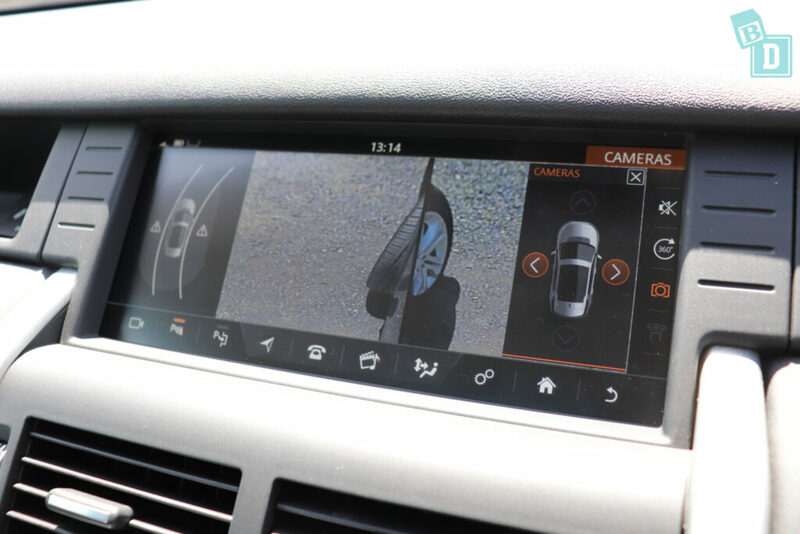 The reversing camera has excellent image quality, you can view all different camera angles and the parking sensor volume can be minimised with the button on the right of the screen or you can turn the volume up and down using the controls on the steering wheel, which is fabulous! Visibility was very good and with the large sunroof and big windows, it had that light, airy feel when you got in and was carried inside from the beautiful blue exterior paint colour and reminded me that mummy doesn't have to mean frumpy!! Overall I found the Land Rover Discovery Sport to be a great BabyDrive for a one or two child family. The car itself is fantastic and definitely feels confident on the road, I felt let down by the media system which I often find in the more expensive cars. The Land Rover Discovery Sport scored a five-star ANCAP safety rating in 2014 and has seven airbags as standard. The boot door of the Discovery Sport opens and closes silently which is really good for not waking sleeping passengers! In the five-seater model as tested here, the boot floor is nice and flat and carpeted, perfect for an emergency nappy change. 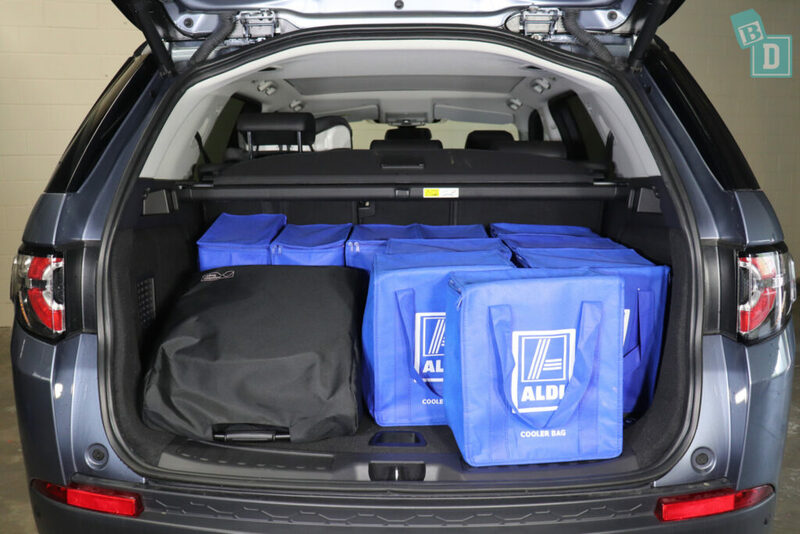 I could fit fourteen shopping bags in the boot when it was empty. The Mountain Buggy Duet twin stroller fit with five shopping bags. The Britax Flexx tandem stroller fitted with seven shopping bags. The Mountain Buggy Urban Jungle single stroller fitted with seven shopping bags. The Mountain Buggy Nano stroller fitted with ten shopping bags around it. If your pet is a consideration, a medium sized dog would fit too. 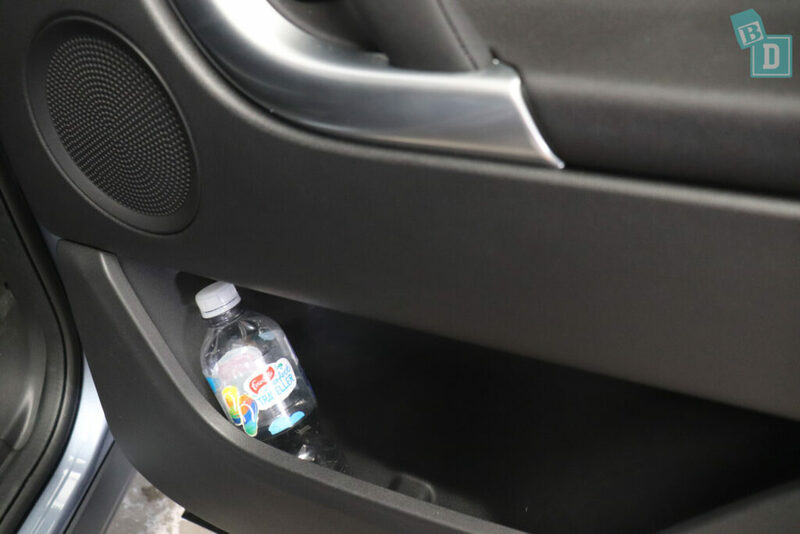 The storage inside the cabin is generally pretty good, there are two cup holders in the central console that would hold a disposable or re-usable coffee cup and a large refillable water bottle fitted in there too. 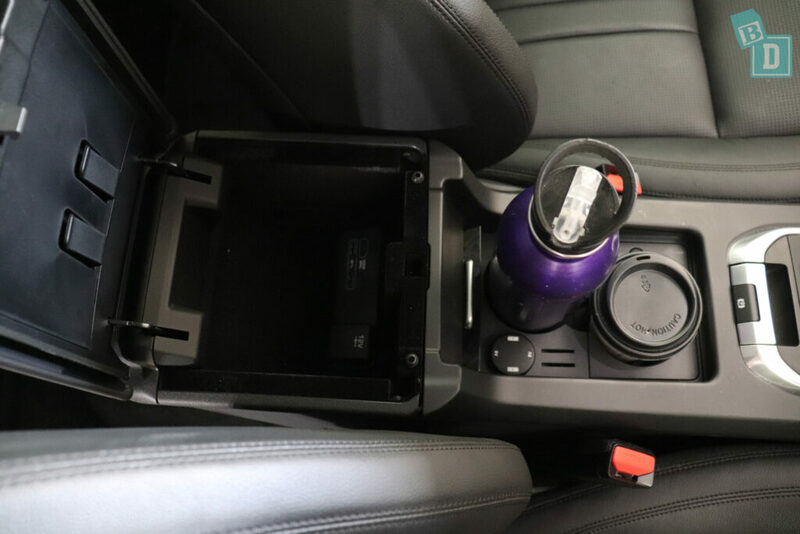 You can remove the front cup holder and there is deeper storage space underneath for anything you need to conceal, like your phone when you go to the beach etc. This could be a useful hiding spot for your secret parents only chocolate bar for when the kids have fallen asleep in the back!! 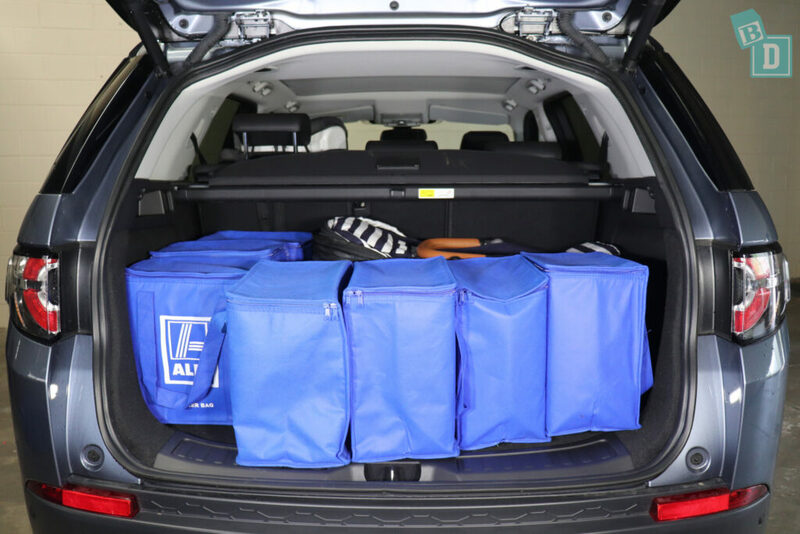 The central console storage box is a good size and you have USB and 12V sockets inside. In front of the gear-knob is a lined well, that I found a good spot for my phone, I did find if I put other bits in there they slid around alot. There is a glasses case in the ceiling that is lined to stop your lenses from being scratched and there are lit vanity mirrors in both front visors. The glove box is a practical size, I could fit an iPad and wallet in there with the manual and it is nicely lined. There is a bag hook on the central console pillar next to the glove box for hanging your bag from. I am inbetween the nappy bag and handbag stage at the moment with my toddler but I did find this hook useful on a couple of play date occasions when I had quickly slung three of every toddler prefered snack into a back as I ran out the door and hooked it on there so the contents didn't empty all over the footwell! The door pockets in the front and back are nice and long but they aren't deep enough to hold a large refillable water bottle which is disco-pointing, they would only hold a 600ml bottle. The map pockets in the back are net so they would hold an iPad but not conceal it. 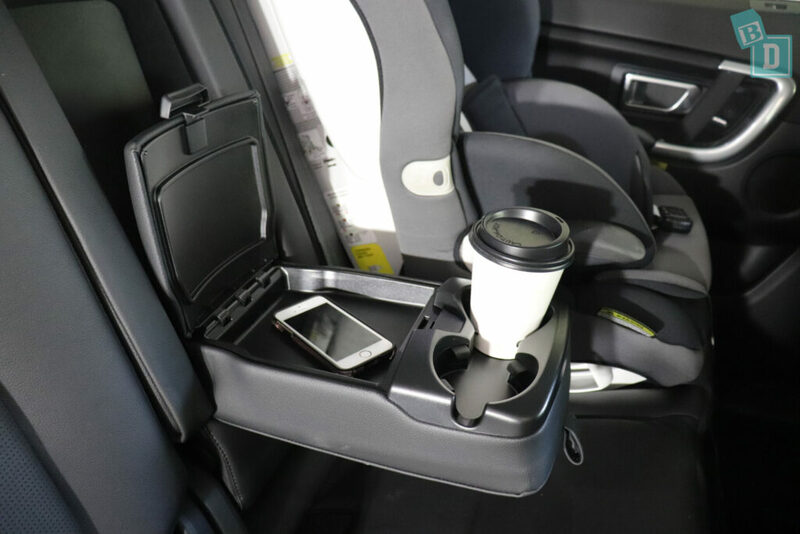 The central seat back has a fold-down armrest containing two cup holders that are a good size to hold a reusable and disposable coffee cup and there is also a lidded section to store two mobile phones. 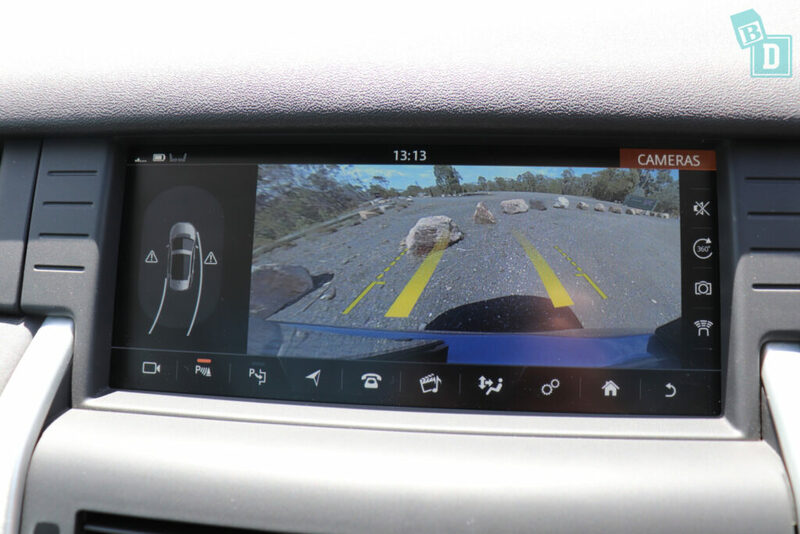 The reversing camera image is excellent in the Discovery Sport, so clear and crisp it made parking and maneuvering easy. There are multiple camera views available too including the kerb view which I found handy to avoid scratching the wheels! The parking sensors can be turned off altogether with a button at the bottom left on the screen. 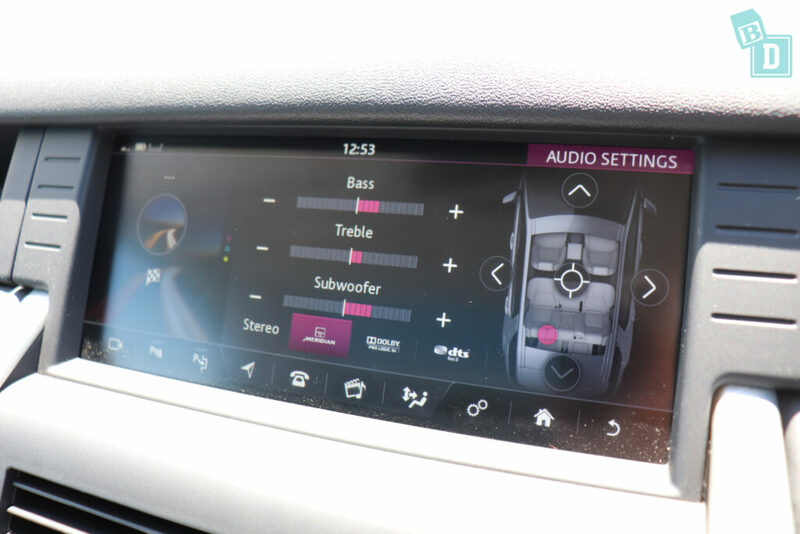 There is also a speaker icon on the top right, which with one touch lowers the volume considerably to be less disturbing for little passengers and the volume controls on the steering wheel can also be used to raise and lower the volume easily too. 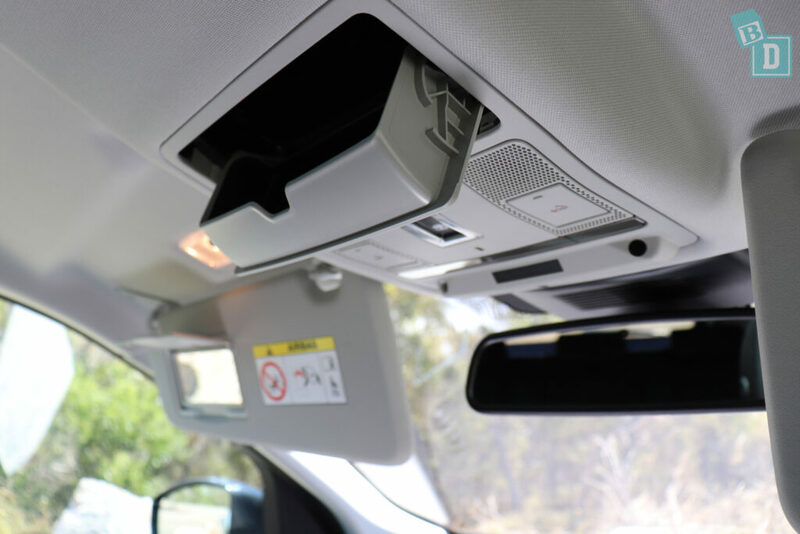 There is a great sound screen that allows you to position the speaker volume over the rear passengers easily. I found this very useful so I didn't have to listen to Hairy McClary audiobook at full volume for the 100th time!! 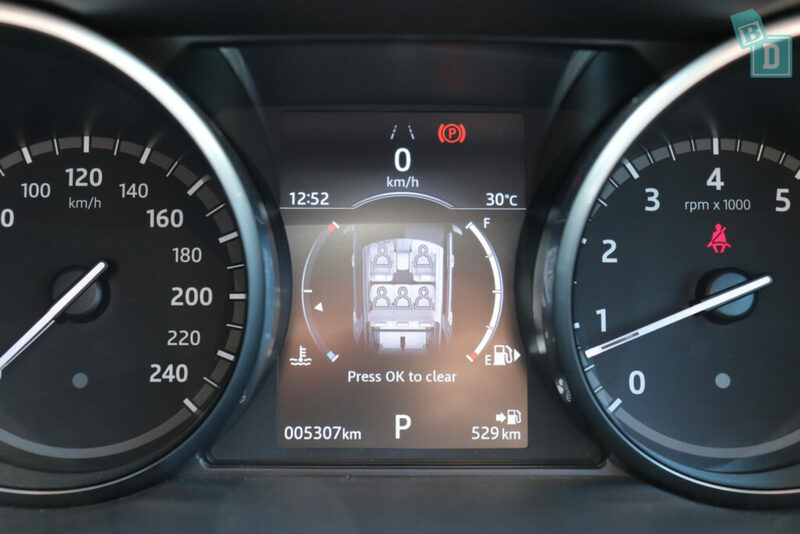 The cruise control buttons are on the right side of the steering wheel and are easy to use, however, I didn't find it very accurate and the car raced sometimes 10km/h over the set speed on undulating roads. 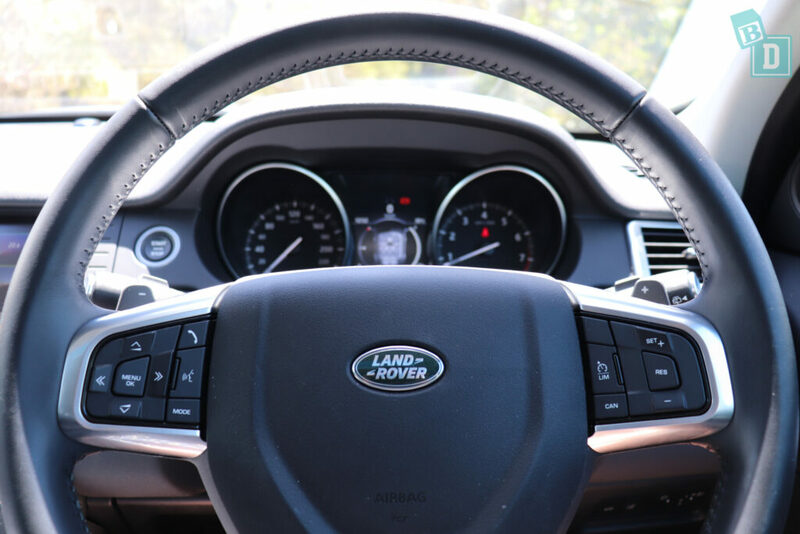 There is lane departure warning in the Discovery Sport and the button to turn that on and off is down by your right knee. The indicator volume in the Discovery Sport is quite a mild sound so I didn’t find it affected my daughter while she was sleeping. 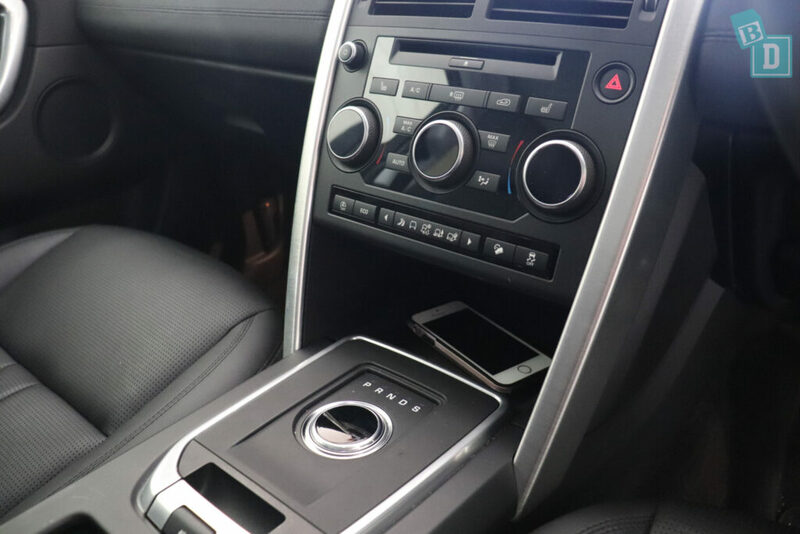 I found the media system was quite simple to use however the images used were really outdated and there is no Apple Car Play or Android Auto in the Discovery Sport. 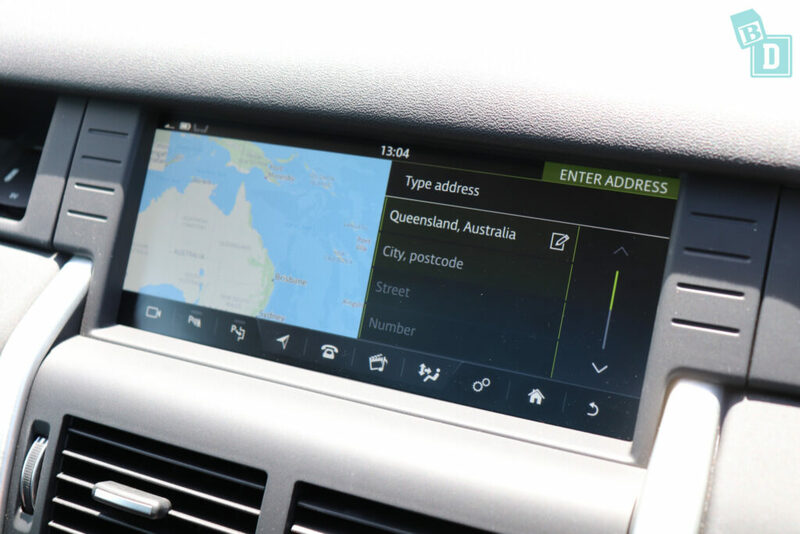 The inbuilt sat-nav wasn't too difficult to navigate and use and you can mute the guidance voice with a button on the screen. Both the doors are nice and quiet to open but they are heavy and they do slam shut. The windows are quite quiet to open and close which is great. You can't come to a stop in the Discovery Sport with the engine on and open the door without getting a chiming noise to tell me the ignition is still running, it is not a shrill noise but it is definitely baby waking and I couldn't find a way to turn it off. 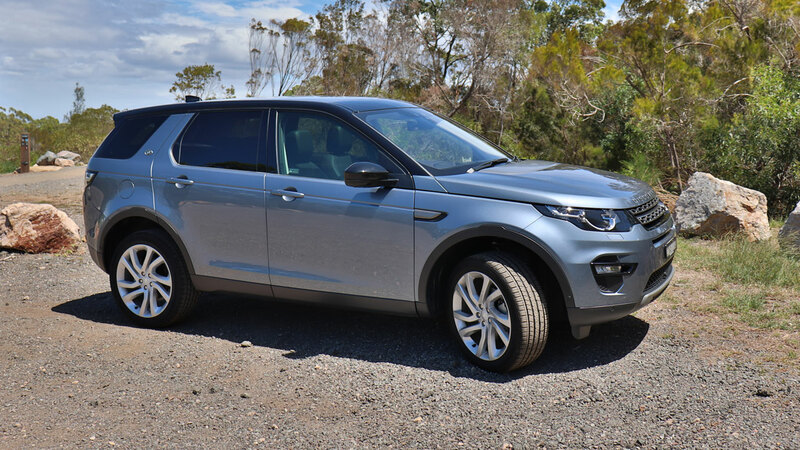 Road and engine noise are good in the Discovery Sport, I didn't find it disturbing at all and the drive is very smooth, I did find on a few occasions when accelerating from a stop there was reluctance and lurchiness when accelerating. The seatbelt removal alarm and visual is excellent, the visual lights up green if a seatbelt is fastened and red if unfastened so you know exactly who has unfastened their seatbelt. 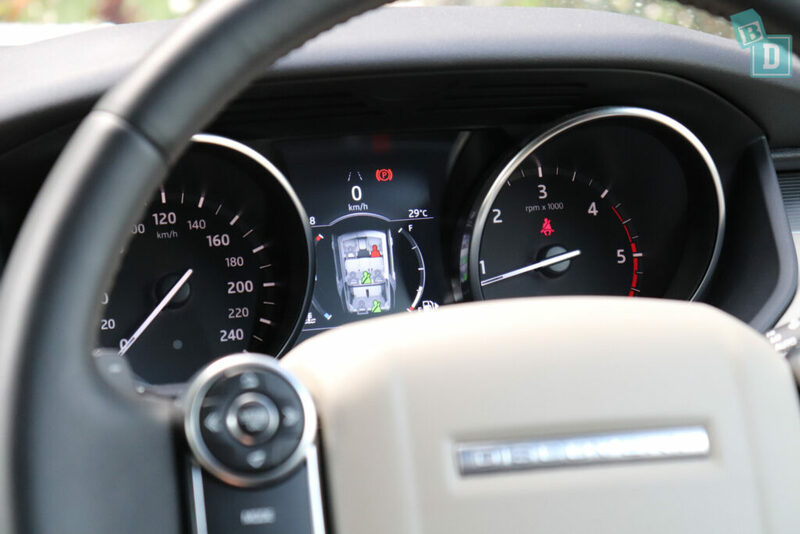 The Land Rover Discovery Sport seven-seater model visual shows all three rows of seats and the seven-seater model of the Discovery Sport also has this display. 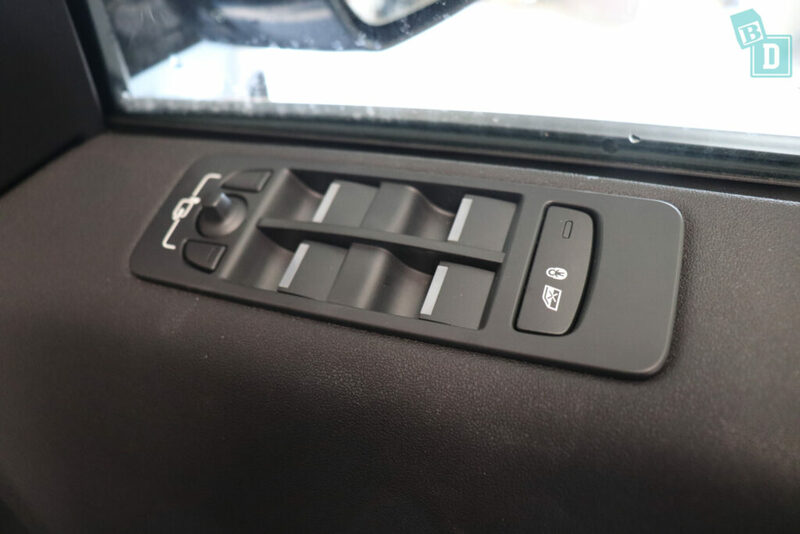 There is also a great child lock button on the driver's door panel that allows you to lock the doors and windows with one press so those rear passengers can not fiddle them whilst going along which is a fantastic BabyDrive feature. 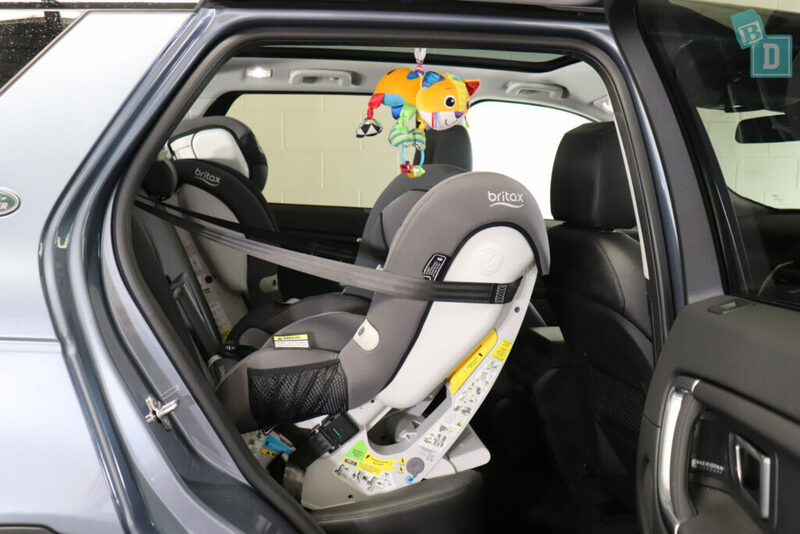 How many child seats fit in a Land Rover Discovery Sport? The Land Rover Discovery Sport I tested is a five-seater and you can have it as a seven-seater at an extra cost, although there are no ISOFix or top tether anchorages in the third-row seats. In the five-seater there are ISOFix points in the two outer rear seats; they are within plastic guides and I found them really nice and easy to connect to. 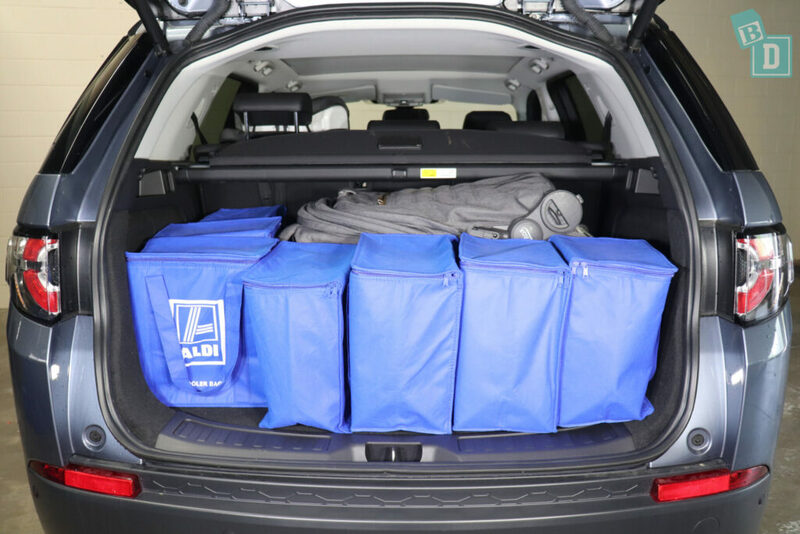 There are top tether anchorage points at the bottom of the backrests for all three rear seats. They are not within plastic guides and sit flush with the boot floor. For these reasons, I found them tricky to connect to. The top tether clip kept getting the seat upholstery fabric caught in it so it wasn't clipped shut and it was difficult because of the proximity to the boot floor. The top tether anchorages do pull out slightly to help with this. I also found that reaching across the boot to reach them was a real stretch (I am 162cm tall). I did get the top tethers attached, just trapping that fabric in the clasp is something to be aware of. I fitted two child seats in the back of the Land Rover Discovery Sport, but found there just wasn't room for a third between them. There was just enough room for me to sit between them and I'm 162cm, though it's only suitable for occassional rides than an all the time. Posting bub into their seats from outside the car is really good for forward-facing seats because there is lots of footwell room to swing them in and headroom is great too. For rear-facing seats, there is a good amount of door opening and head height also and you are not bending down too low. From inside the ceiling height is good for posting bub into their seat too. 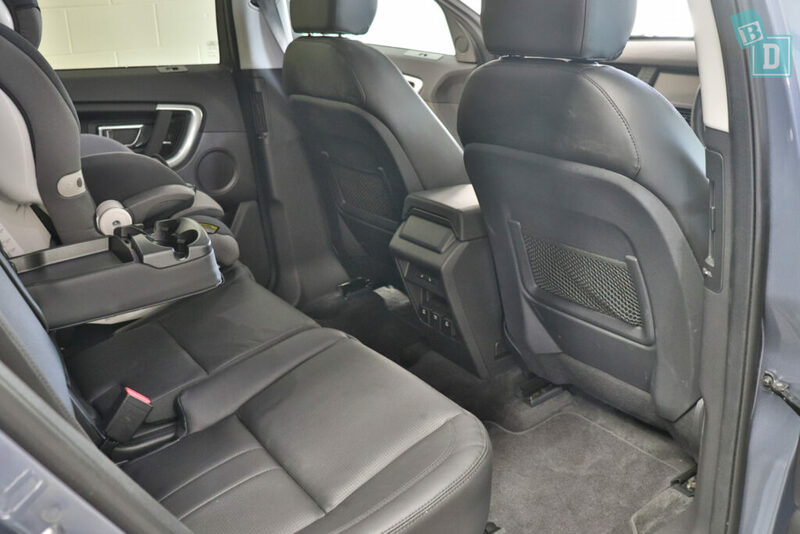 Legroom is excellent in the five-seater model, with plenty of room for a 182cm adult to sit in front of a rear facing child seat. I imagine if you had the third row of seats then the legroom would be considerably less. The second-row seats slide on a 60:40 split however you would still need to uninstall a child seat in order to access the third-row seats. With only one child seat installed, there is plenty of room for feeding bub in the back. 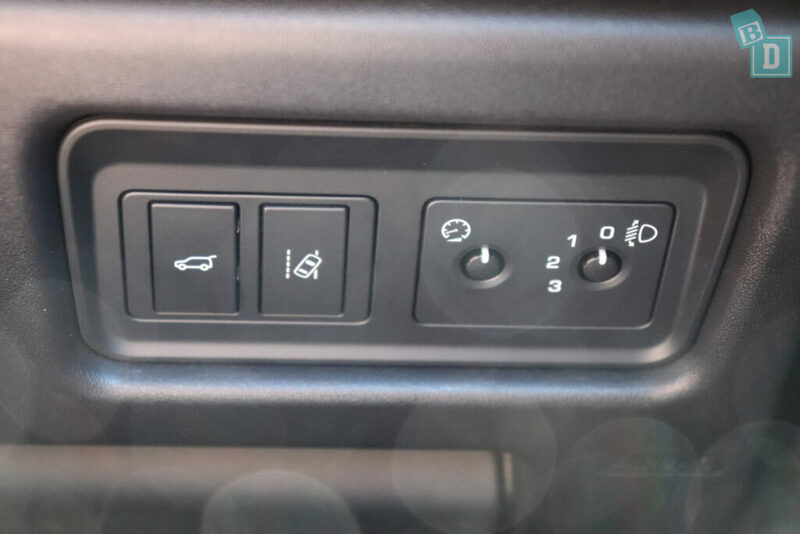 The front seats in the Discovery Sport have electronic controls on the side of the seat base. Once I had played around with them including the lumbar support they were comfortable. I found I could not wear a ponytail because of the headrest and they were not adjustable. 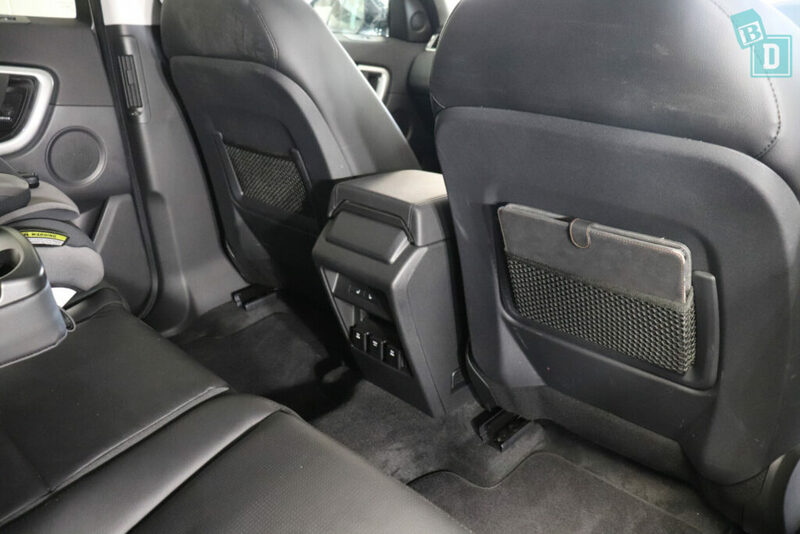 The front and rear seats are leather and perforated in the central panels for the heating. The perforations would make them harder to keep clean of kids crumbs and spills. In the second row, the seats are comfortable, I found in the central seat the seatbelt clips are quite rigid so could be a little painful on your bottom! There is a small hump in the central footwell which I didn't find a problem when I sat there. 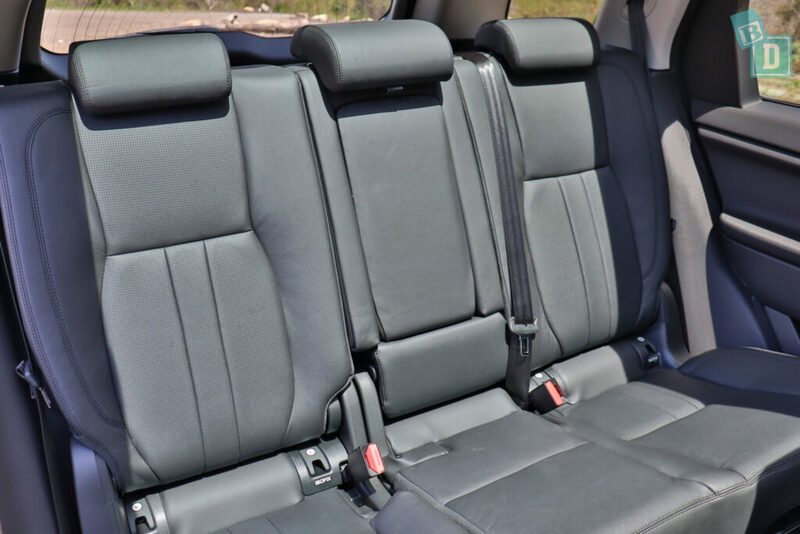 The rear seats slide and adjust for legroom on a 60:40 split and to help accommodate the seven-seater models. The central seat back also comes forward, giving access through to the boot. Legroom is really good in the five-seater Discovery Sport, with a rear-facing child seat installed we could sit a 182cm driver or passenger in front of it. The fuel distance to empty is shown in the digital display in front of the steering wheel, which is a must for me now I'm a parent. 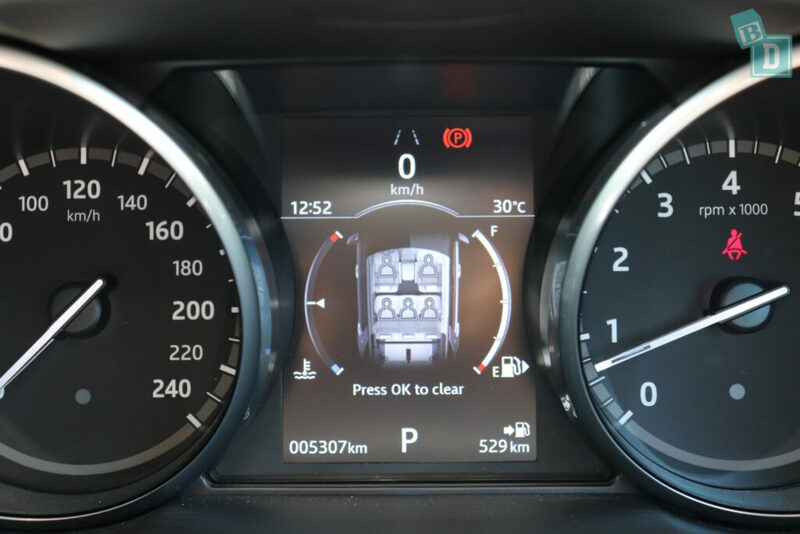 There are four identically sized air-con vents across the front dashboard; two in the centre below the media screen, and one at either end. For the second-row passengers, there is one in each of the side pillars. We found these really effective for subtly cooling the second-row passengers without blasting them with air. There are also rear heated seat controls in the back of the central console box. with a 12V socket and two USB's. The air-con controls on the dash are simple to use while driving and I found the airflow to be effective without being too loud and huffy. 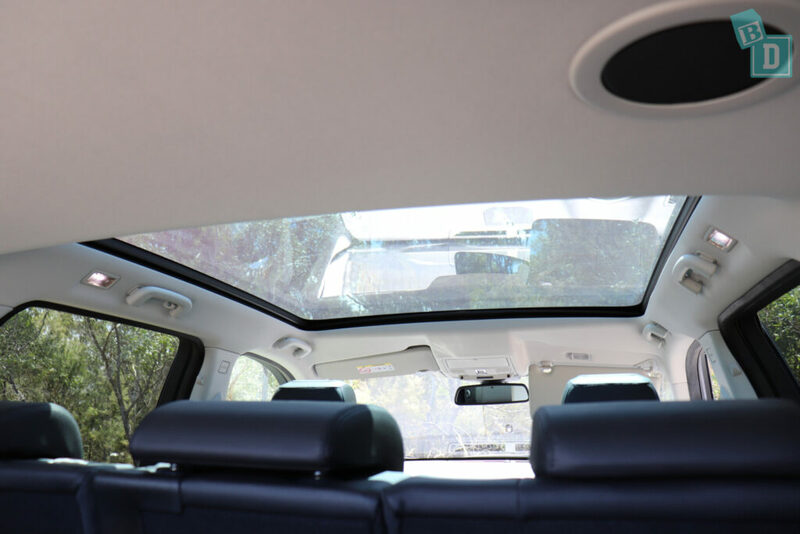 Visibility for the driver is good in the Discovery Sport, the windows are all nice and deep and with only two child seats in the back, I could see through the middle and out the rear windscreen. Visibility when parking is good and out of the front and rear side windows, the reversing camera image is very good too. One thing I have noticed since being a mum is I hate it when I reach a destination or get home from being out and Tulsi has either done really well in the car or she is screaming her head off and I have done really well to keep it together for the entire journey (usually the latter!!) and it takes 10 minutes to park the car! It can be really stressful. Usually I dread when we get big cars or Utes as they take longer in our tight apartment block carpark, but the great camera quality made the Land Rover Discovery Sport easy to reverse park too! For forward and rear-facing passengers in the back, the windows are nice and large and the huge sunroof definitely was a novelty that made the car feel very light and airy. In the front, both passengers have lit vanity mirrors in their sun visors. The visors are not extendable though. The interior lights in the back are either side of the sunroof, next to the grab handles in the ceiling above the rear doors. I could not reach those while driving unfortunately which made driving at night tricky, however, the large sunroof does allow little ones to look at the stars! I have found the Land Rover Discovery Sport a great car for driving around town and out on the open roads. Being an SUV you sit a little higher on the road so you get a good view too. I did find it a little lurchy at times when accelerating from stopped but other than that it is a very enjoyable BabyDrive. The interior is very nice and all the dash and door surfaces would wipe clean easily being made of leather, plastic or rubber. 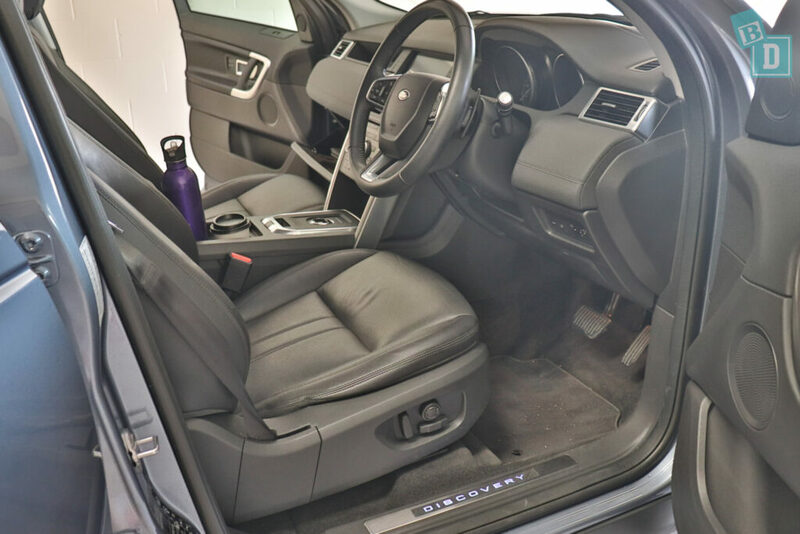 There are floor mats throughout the Discovery Sport. 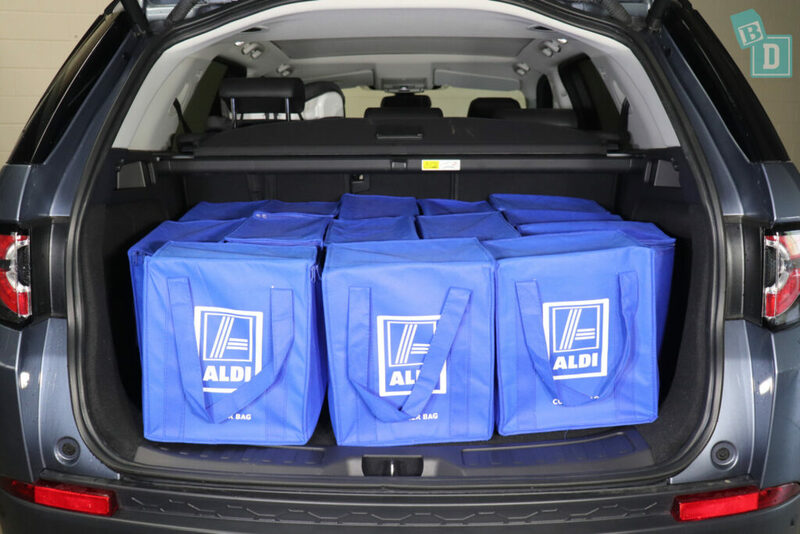 The tailgate is silent to open and to close which is a great BabyDrive feature, so you can access the boot while little ones are asleep without disturbing them. The Land Rover Discovery Sport was given a five-star ANCAP safety rating in 2014. 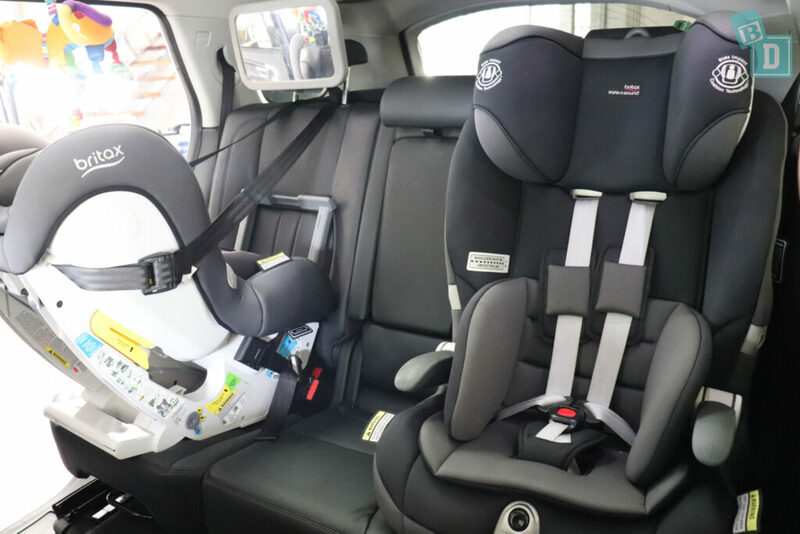 In testing it scored 83% for child occupancy protection (41 out of 49), 93% for adult occupancy protection (35.6 out of 38), 82% for safety assist technology 10.81 out of 12) and 69% for pedestrian protection (25.2 out of 42). The Land Rover Discovery Sport has seven airbags as standard. Both front passengers get front and side chest airbags and a drivers knee airbag. Side curtain head airbags extend to all three rows of passengers. Only the front seats come with pretensioner seatbelts. As standard, the Land Rover Discovery Sport comes with anti-lock brakes (ABS), automatic headlights, autonomous emergency braking (AEB), daytime running lights (DRL), electronic brake force distribution (EBD), electronic stability control (ESC), emergency brake assist (EBA), emergency stop signal (ESS), hill launch assist, lane departure warning (LDW), reversing collision avoidance, roll stability system, speed assist system (driver-set speed limiter). Blind spot monitoring (BSM) is available on some variants.